It’s not too late to Pick.Click.Give to the Bread Line! When you sign up for your 2019 PFD, you can Pick.Click.Give and support the Bread Line’s anti-hunger programs. Already signed up without donating? No problem. You can still add to or change your pledge amounts. 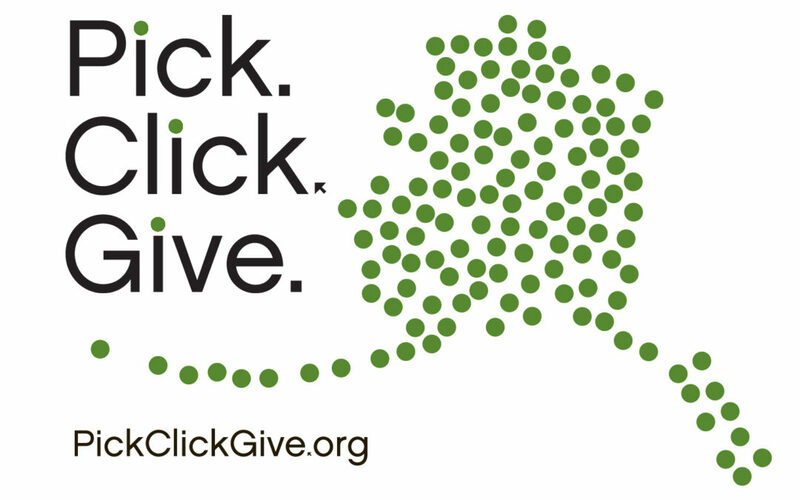 Join the 30,000+ Alaskans who give back to our community through Pick. Click. Give. The deadline for 2019 PFD applications are due March 31st – but you can add or adjust your Pick.Click.Give pledges through August 31st. In 2018, the Bread Line served over 30,000 hot meals and gave out over 11,000 sandwiches to our neighbors in need. We also graduated nine people from our job training program, had dozens of local kids participate in a monthly family volunteering day and harvested more than 2,000 pounds of produce in our community garden! All of this is possible because of people like you. Though the generosity of Alaskans, we feed anyone who is hungry, without question. Our guests include people experiencing homelessness, some afflicted with the hardship of untreated mental illnesses or chronic substance abuse. We also serve low-income individuals and families as well as people who have suffered a devastating personal loss, such as a fire, divorce, or death that left them without the resources to achieve food security on their own. There are seniors here who – though housed – must make choices between paying rent and buying food. Some of our guests are itinerant workers, between jobs or people struggling to find employment at all. Everyone is welcome at the Bread Line. Our unofficial motto is “love all, serve all” – and we do. The Bread Line, Inc. operates four main programs aimed at feeding those in need and creating paths to self-sufficiency: at the Stone Soup Cafe, Chef Matt serves free, hot, nutritious meals every weekday from 7:30-9:30AM – we also offer a sack lunch to go; the Stone’s Throw culinary job training program empowers people with barriers to employment by teaching job and life skills in a twelve week class, lead by three professional chef instructors; during the summer, the Stone Soup Community Garden grows healthy vegetables to supplement community food donations and provides fresh greens to several downtown assisted living facilities; once a month we host a Kid’s Cafe, where local families help prepare food for the following week and talk about the importance of community service. Your donation helps purchase food and supplies, fuel oil and electricity – all the things crucial to keeping our doors open. If you would like more information or would like to become involved, please email info@breadlineak.org or call our office at (907) 452-1974 – we are always happy to talk about our work.